The relief of Bastogne turned the tide in the Battle of the Bulge and Hitler’s final great offensive of World War II lay in ruins. P47 Thunderbolts of the 406th Fighter Group, in company with P38 Lightning’s, support the advancing armor of General George Patton’s US Third Army as they prepare to relieve the battered 101st Airborne Division from their heroic defence of Bastogne during the final climax to the Battle of the Bulge, 24 December 1944. 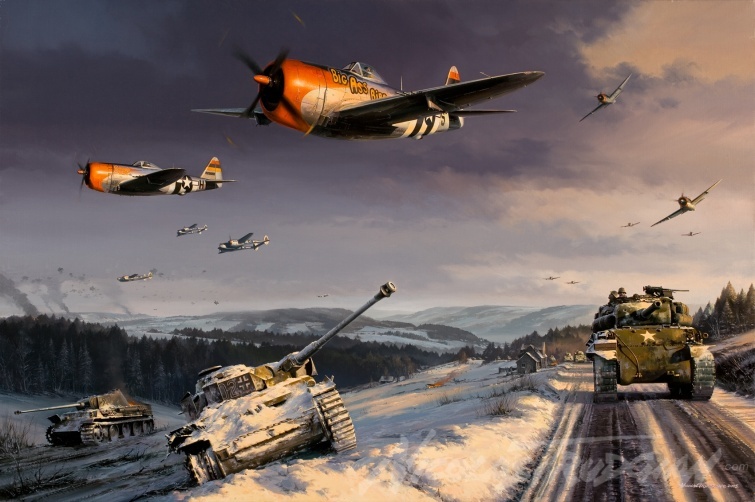 The Battle of the Bulge was one of the largest land battles of WWII with more than a million American, British and German troops involved, incurring huge casualties on all sides and this release pays tribute to the sacrifice of Allied Forces, during this important milestone in World War II. Click here to navigate an enlarged image of the original painting by Nicolas Trudgian. Each print is numbered and signed in pencil by Nicolas Trudgian and the signatories and is issued with an original certificate of authenticity from the publisher. The only opportunity to obtain the full-size canvas reproduction of this painting, individually signed and numbered in paint by the artist. Size when stretched: 36" x 24". Particularly popular for shipping overseas, these canvas giclee prints are supplied rolled and will require stretching onto wooden formers by your picture framer before framing. The only opportunity to obtain the full-size canvas reproductions of this painting, individually signed and numbered in paint by the artist. Neatly mounted on wooden stretchers and with picture-hanging cord already fitted so that the giclee print may be hung on the wall straight away, even without a traditional frame.